Help the Elmvale Maple Syrup Festival help the Community. Every year the sleepy town of Elmvale explodes in a celebration of Nature’s rites of Spring, the running of the Sap, Maple syrup to be exact. The town transforms into a shoppers’ mall. Follow County Road 27, 20 km’s north of Barrie to the annual celebration of the sweet Spring gold, Maple Syrup at the exciting Elmvale Maple Syrup Festival. 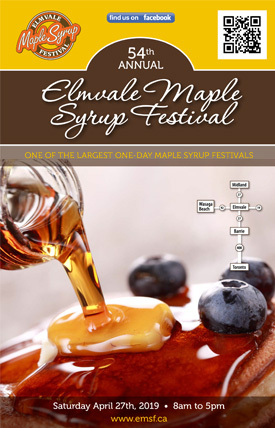 Advertise in the ‘EMSF Guide Booklet’ and/or on the ‘EMSF WebSite’ and support the Elmvale Maple Syrup Festival efforts to help our community and surrounding area. All festival funds raised stay local. The Elmvale Maple Syrup Festival wishes thanks to its generous community minded sponsors. The Elmvale Maple Syrup Festival Digest is your tool to market your products and services as well as an opportunity to support our community. We distribute 8,000 copies of the Guide all around Central Ontario weeks before the Festival and we hand out thousands on Festival Day.We include maple syrup recipes and interesting articles to give the Guide and your advertising a much longer “shelf life” in the homes of our visitors. The Elmvale Maple Syrup Festival attracts people from near and far. Many weekenders search online for quick things to do and close places to visit. Since we are not that far away from the Big City, Elmvale has proven to be an attractive short trip destination. Our web site offers you the opportunity to show your company to many tourists and festival seekers for one full year. Email Irene Burgler at: burgleri1953@gmail.com between Jan 3rd and Feb 1st for advertising information.